Fans of Nirmala Rajasekar shared a post. "This album deserves wide attention both for its beautiful music and message." We could not agree more! What a BEAUTIFUL review from Songlines... congratulations to the Maithree ensemble: Nirmala Rajasekar (veena, voice) Muruga Boopathi (Indian percussion) Michelle Kinney (cello) Pat O'Keefe (winds & cowbell) Tim OKeefe (world percussion)! And if you haven't done so already, listen to Maithree here: https://open.spotify.com/artist/0rAdVEwwjb9wh4BXb2wfTl 2 months 6 days ago. Maithree: The Music of Friendship is one of Mundofonias’s favorite albums of the month!! Check it out below 👇 Nirmala Rajasekar innova Recordings 3 months 1 week ago. Fans of Nirmala Rajasekar is listening to Nirmala Rajasekar. Listen RIGHT NOW to Smt @Nirmala Rajasekar’s wonderful All-India Radio broadcast — choose AIR Tamil! http://allindia.radio.gov.in/ 3 months 1 week ago. Check out this review from Jazz Weekly of Smt. Nirmala Rajasekar's latest album, Maithree: The Music of Friendship! Listen to the album: https://open.spotify.com/artist/0rAdVEwwjb9wh4BXb2wfTl https://itunes.apple.com/us/album/maithree-the-music-of-friendship/1437909057?ign-mpt=uo%3D4 https://www.innova.mu/albums/nirmala-rajasekar/maithree https://www.amazon.com/Nirmala-Rajasekar-Presents-Maithree/dp/B07HBK4HH6 3 months 1 week ago. In Golu played then with students 4 months 5 days ago. When Minnesotans sit cross-legged for hours on end in a state of blissful trance, they are generally ice fishing. Not so with this group of citizens; they are playing South Indian Classical music right here in the frozen north. Equally celebrated in India and Minneapolis, these five all-star musicians have come together for Song of the Veena, a mesmerizing introduction to this medieval instrument. An engineering marvel — originally of gourds, bamboo and wire — the veena has a subtle, rich tone not unlike a sitar after a strong cup of tea. Its tone, usually mangled by the use of contact mics in performance, has been captured here for the first time in all its clarity and depth. In the hands of Nirmala Rajasekar, who has been playing it since the age of 13 (when she could barely hold it! ), it comes rivetingly alive. She is a disciple of Kalpakam Swaminathan and has earned top accolades from Indian Radio and Television. She is also a fine vocalist in the Carnatic tradition and received Minnesota’s prestigious Bush Artist Fellowship in 2006. Accompanying her are fellow Minnesotans Balaji Chandran (Ghatam), Marcus Wise (tabla), V. Srinivasan (Mridangam), and Vijaya Desikan (violin). The program starts with some light popular numbers before getting into the heavier ragas, where their talents of spontaneity, intelligence and feeling are amply demonstrated. Substitute the lefse for a poori and the Mississippi River for the Ganges, and you will love this joyful album. At the outset a great album by an awesome artist presented by Innova. What struck me the most is the way the authentic sound of the Veena is preserved in this recording. It is a challenge to the sound engineers in a concert setting or on an album to get the sound of this instrument to its authentic tone. Truly appreciate the work done by Mathew Zimmerman at Wildsound Studio MN. Since having a background of Carnatic Music, I understand and absorb so much more from this album and the presentation of the Songs. It is in a concert format but the Ragas and the songs selected are an interesting mix. I have heard from others, who don’t have a Carnatic Music background, but simply listening to the sound and the melody of each piece, that this is like a river flowing. The challenge for an artist to play this authentic seven stringed instrument Veena is “how close can you get to imitate the human voice”. Practically you can hear the Veena Sing. There are so many factors involved, the plucking of the strings, gliding of the fingers…timing, and how the lyrics fall into place. Nirmala has comfortably achieved it all. The other large component of Carnatic Music is Improvisation. Nirmala has done in piece # 5. with Alapana..Tanam, Niraval (variation of the lyrics line) and at the end Swara Kalpana (improvising different combination of the notes of the scale). This has been done beautifully bringing the essence of the Raga. The percussion is apt, with the timings and the variations of the sound. The violin is subtle yet so beautifully blended. Yet another challenge well met by the accompanying artist who has shown so much sensitivity to play along with the Veena. Nirmala’s long association in the field of Carnatic Music and her total dedication, practice and learning behind her versatile playing is much admired. It’s not an easy instrument to handle. Need a life long commitment and hours of practice to play with such ease. 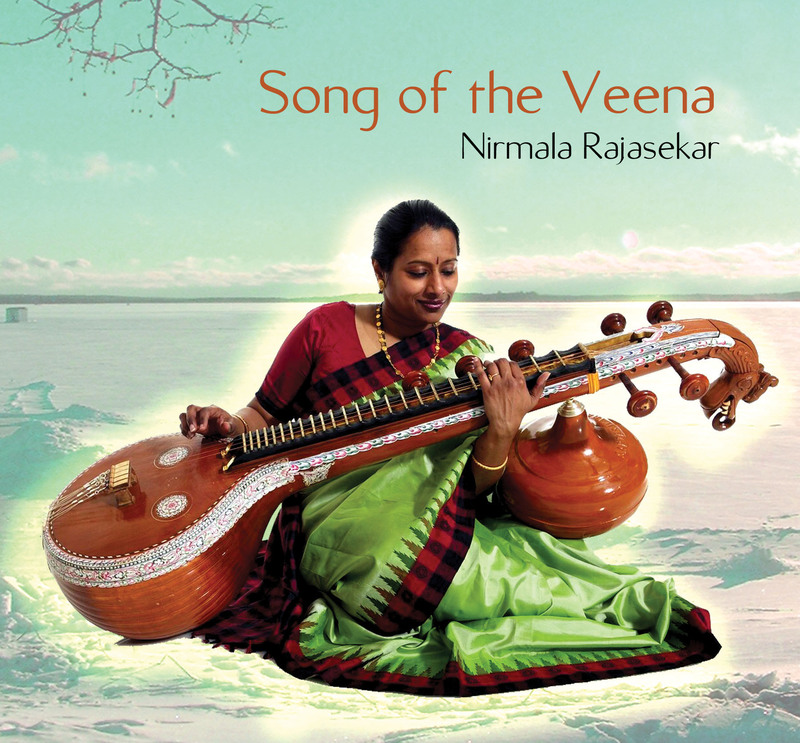 All in all the “Song of the Veena” truly Sings . Would like to listen to more album of this versatile artist Nirmala Rajasekar.